Precision medicine — also called individualized medicine — got special attention recently when President Barack Obama announced a Precision Medicine Initiative and called for the creation of a national biobank. 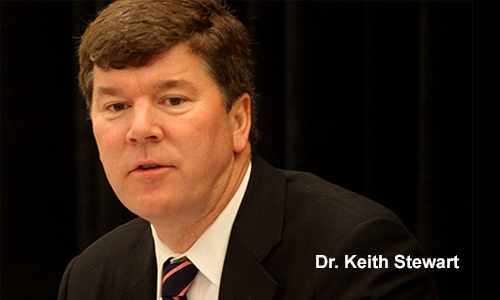 Dr. Keith Stewart, the Carlson and Nelson Endowed Director of the Center for Individualized Medicine, went on Mayo Clinic Radio on April 25 to discuss the biobank and why it’s important for the future of health care. Dr. Stewart is also recognized as the Vasek and Anna Maria Polak Professor of Cancer Research. Our colleague Colin Fly was kind enough to transcribe the interview with Dr. Stewart. We’ve posted an edited copy of it here so faithful readers of the CIM blog — and those who are becoming faithful readers of the blog — might gain a better understanding of the work being done at the Mayo Clinic Center for Individualized Medicine and why it’s important for the future of medicine in the 21st century. For the full conversation with Dr. Stewart, listen to the podcast. What is the difference between individualized and precision medicine? Dr. Stewart: They’re essentially interchangeable. We use the term individualized medicine which may have a broader connotation. What does it mean? Tailored, precision, individualized? Dr. Stewart: What we’re really talking about is the human genome and how we can use that to impact patient care and improve that over time. The human genome was first sequenced about 12 years ago through a billion-dollar, government-funded effort. Since then, there’s just been an explosion of work trying to understand how we can interpret that and use it for patient care to the better. You will take my genome, or a patient’s genome, and that will help you treat patients better? Dr. Stewart: That’s absolutely right. We can understand or diagnose diseases that we didn’t even know about before. We can interpret what’s gone wrong with the genome in somebody who has cancer, for example. We can even take a healthy person’s genome and try to interpret that to understand what might happen to them in the future or what might be inherited by their children that perhaps we can intervene with. Those are the three major pillars of what we think we’ll be able to do. To do what you need to do, you have to have the person’s genome. How do you get that? Dr. Stewart: The genome is the DNA in your body. It’s present in every cell. It’s what you’re born with and it basically determines what you’re going to be like through life. It’s now relatively cheap to sequence a genome. It was very expensive to start with, but costs have plummeted over the past decade. To me, 20 years from now everyone will have their genome sequenced routinely, probably not long after their born. It would seem illogical not to. It’s cheap. It doesn’t change over the 100 years you live. It contains all sorts of fascinating information about your genetic predisposition to disease and how we can interpret that and how we can use that. So to me, that’s the goal. 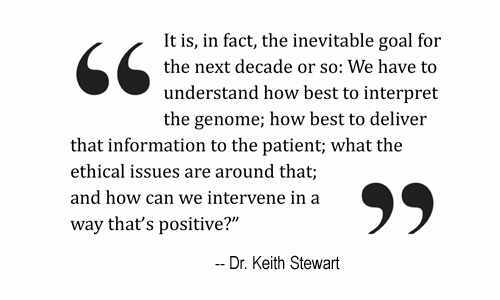 It is, in fact, the inevitable goal for the next decade or so: we have to understand how best to interpret the genome; how best to deliver that information to the patient; what the ethical issues are around that; and how can we intervene in a way that’s positive? How many patients have already been done? Dr. Stewart: Many. Thousands of cancer patients around the country and many hundreds here at Mayo Clinic have had their genomes sequenced and the cancer they’ve developed sequenced to look at the differences to try to understand where the Achilles’ heel is in the cancer that has arisen. Cancer is a genetic disease and to try to intervene with drugs that we think will help, we have to understand the specific mutations. We’ve also now started to offer a healthy genome program so you, today, could come to the clinic and have your whole genome sequenced and we will try and help you understand what we understand today and as time goes on, update that as new information comes in. For the healthy patient, how does knowing your genome helps? Dr. Stewart: In the healthy genome program we offer a number of services. One is we just focus on the genes in your body that might interact with drugs you might take in your life and give you recommendations on what drugs you’re likely to have more side effects from, what drug you should use a lower dose of or avoid all together. We call that pharmacogenomics. Part two is we can, if you want, look at your genome for genes that are hereditable by your children or might explain some strange condition that runs in your family. We can look for those specifically and individually. Then finally we can do the whole genome — much of that we don’t understand today, but we will over time. The other area where we’ve found this to be quite useful is a diagnostic odyssey. These are often a pediatric population or a family that has a rare disease that nobody understands. By sequencing the genome, in about a third of those cases, we’ve been able to find a genetic mutation which does explain and sometimes leads to powerful therapies to correct what was previously unsolvable. How do I have my genome sequenced? Dr. Stewart: So we have a specific service where the first thing that would happen is you would come and meet with a genetic counselor and they would explain what you’re getting into, what’s involved, what you’ll likely learn and what you won’t likely learn so we don’t offer things we can’t deliver on. Insurance companies right now will not reimburse most of this fully, so there is an out-of-pocket cost to getting your whole genome done today. How much is that? A few thousand dollars? Dr. Stewart: It’s about $9,000 to have your whole genome done. If you want the pharmaco genome, it’s only $1,000 to $1,500. There’s a fee for the genetic counselor. Some of it is reimbursable by insurance if you have a rare family condition, or if you have cancer that will get paid for. President Obama’s initiative commits $270 million to the program. That really isn’t very much, is it? Dr. Stewart: It’s not. But I think it’s an important start. I think the important thing is he embraced this; there’s going to be seed funding for the program. Ultimately, it’s going to cost much more than that to sequence a million patients in the United States — not patients, a million healthy individuals in the United States. We’re contributing a little bit to that. We have 50,000 Mayo Clinic patients in our Biobank and we’re beginning to sequence the genomes of those patients. The beauty of that is they’ve had their care here and we understand what happened to them, sometimes over their lifetime if they’ve had all of their care here and we can interpret the genome and help apply that to other populations going forward. Is the Mayo Clinic Biobank part of national biobank? Dr. Stewart: We’d like to be part of it. That’s still being sorted out. There are still issues with geography and diversity of the population, but certainly we’d like to play a role in that. What is the benefit of the national biobank? Dr. Stewart: Well, the benefit is getting from where we are today where we can sequence the genome but we don’t fully understand how that will impact people’s health over time to doing enough patients to have all of the major diseases represented. We can look backward and say, “Could we have told you that ahead of time, could we have done anything about it?” Some diseases are not that common, so you need a very, very large population of patients. You need different ethic diversities, you need different ages, you need different sexes. All those things require a very large sample size so we can cover all those major problems. One of the really fascinating things we’ve started to look at too is it’s not just the DNA you’re born with, it’s what happens to it afterward. In identical twins, for example, different things happen to them during life. We call that epigenetics. Like the decorations on a Christmas tree, what turns them on, turns them off? Why does it light up or go dark? We need to understand how that impacts care. Then finally, we’re interested in the bacteria in your body. They have a genome. It interacts with the human genome on a daily basis. We call that the microbiome. And it’s turning out to be really quite interesting in how it impacts human health and how it can change over time if you end up on antibiotics or in a hospital or sometimes just the daily stresses of life can change it. Is it myth or fact that sequencing can help predict diseases? Dr. Stewart: That’s a fact, though it’s not 100 percent known what all the genes in our body do today. There are many diseases which are genetically based and we can predict if you have that genetic change in your genome, you’d be at higher risk for developing disease later in life. Are we at point in time where you could say you could get a disease? Dr. Stewart: To a certain degree, some of them very clearly. Cancer is a good example. Very clearly there are genes which give you a high risk of developing cancer later in life. You’ve seen prominent examples of that in the media recently — Angelina Jolie having a mastectomy and a hysterectomy because she was found to have a gene that would predispose her to those cancers. There are certain genes we know will make your cholesterol go too high and put you at risk for heart disease, and there are genes that are now being identified that will put you at risk for psychiatric illness or even dementia problems. That’s where things get a little tricky. If you’re young, I’m not sure many people would want to know when they’re 80 years old that they’re going to have dementia. At this point, we ask the patient, how much do you really want to know? And remember, it’s not just you; it’s also your children, your grandchildren. It’s going to pass down through those heredities. That’s why the first step is a visit with our genetic counselor so you understand just exactly what you’re signing up for. Coronary artery disease is another example. We might be able to tell you you have genes that put you at higher risk, but you may not get coronary artery disease unless you smoke or become obese or don’t exercise, and that’s where we think there might be modifiable risks where we say you’re at high risk, but if you behave yourself, you could reduce that risk. This is part of the reason we can’t sequence your genome today and give you the full spectrum. It’s going to take a couple of decades and a million-person biobank to sort out those issues. My mother is an identical twin, she has rheumatoid arthritis; her identical twin doesn’t, but has diabetes. How does that happen? They have exactly the same genomes. So, clearly there’s modifiable features in what we call the epigenome. These are the things that decorate the DNA over your lifetime and are influenced by your lifestyle. If a person wants to be part of national registry, or the Mayo Clinic Biobank, what do you need to do? For the president’s registry, there’s nothing to be done today because it’s still being worked out, if they’d like to join the Mayo Clinic Biobank please give us a call.